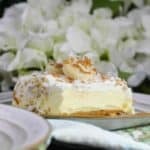 I compare classic desserts to TCM. In case, you don’t know what TCM is? It’s a TV network station that plays all the old classic films released prior to 1970, with no commercial interruptions. TCM stands for Turner Classic Movies. Have you heard of it or ever watched it? My kids think I’m a weirdo and make fun of me, but I can’t help it! I am hopelessly and totally obsessed with these black and white movies. They’re just so iconic looking, have a much higher quality of storytelling and I always feel transported to a former time period. My favorite era when movies were made are from the 40’s and 50’s. AND…I love they way they dressed back then, so retro, so fashionable, so classic. However, I found I do not like silent movies, that was back in the 20’s and 30’s and I do not like Westerns, most musicals and war movies, with the exception of all World War II history. Amazon links are used on this post. I turn the channel when those comes on, but when movies like the spectacular Gilda , Casablanca and Gaslight appear on my screen, I’m glued to the set! Might as well not talk to the hand, ya know? I’m just not much into the fake reality TV, game shows and it makes me mad when the history channel has dumb reality shows that have nothing to do with history…Shows like Ice Truckers or Swamp People? Please…BUT! If it’s a competing cooking or baking show, I will watch those, because that’s what I love to do myself. Did I ever tell you that I was contacted by a casting producer to cast for “Halloween Baking Championship” and “Holiday Baking Championship“ back in April 2017? I was so excited, but the timing was bad and I had to turn it down probably the chance of a lifetime, but the thought of being in front of millions of people if I had been cast, seemed really scary to me! 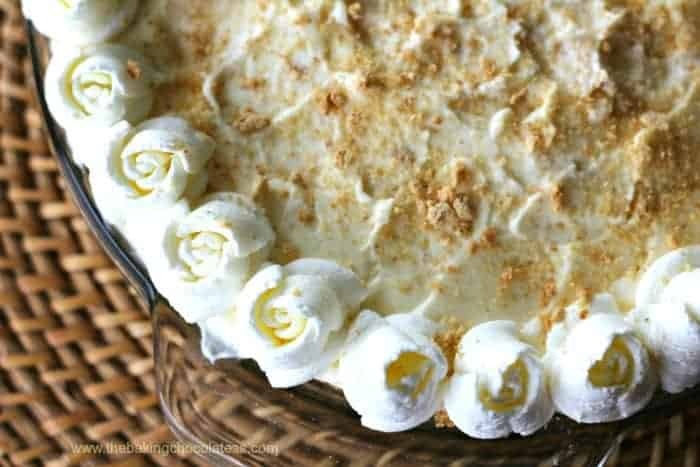 Creamy vanilla cheesecake pudding dessert with a layer of banana slices throughout on a buttery graham cracker crust and some fluffy whipped cream on top sounds pretty damn good! It’s a classic!! It’s delectable!! 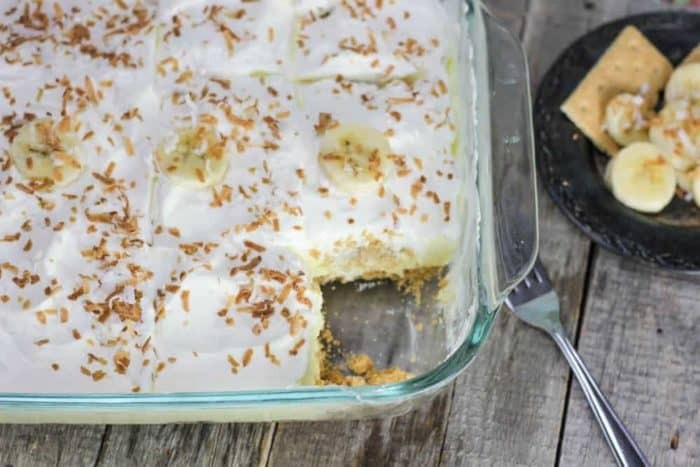 Banana Cream Pie in a pan!! 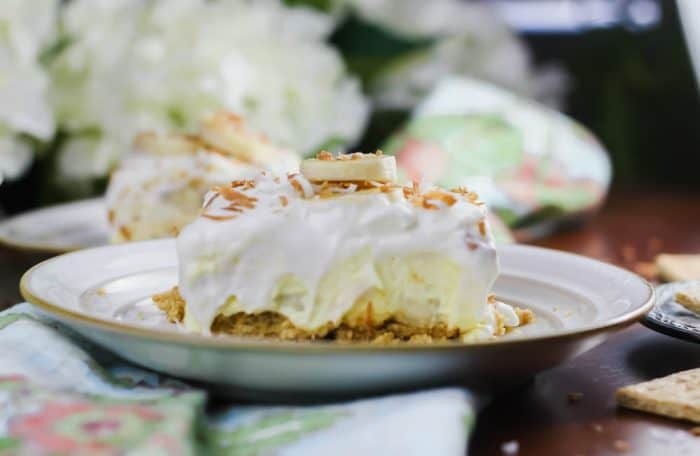 Creamy vanilla cheesecake pudding dessert with a layer of banana slices throughout on a buttery graham cracker crust and some fluffy whipped cream on top sounds pretty damn good! It's a classic!! It's delectable!! 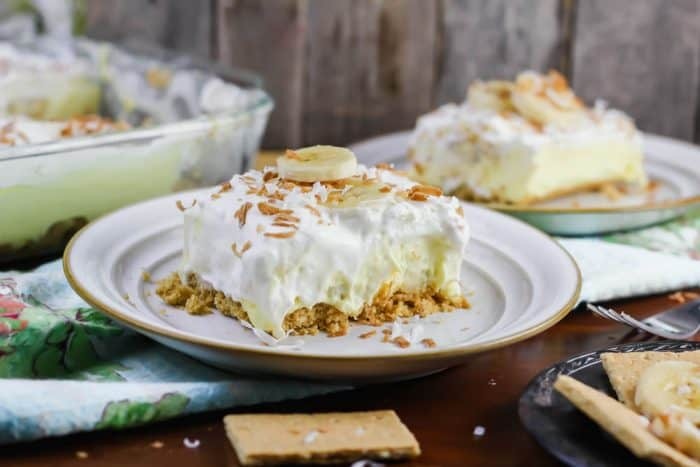 Banana Cream Pie in a pan!! Preheat the oven to 375 degrees F.Add the melted butter, sugar, salt and graham crackers together and combine. Add 1 teaspoon of water to combine so the crumbs are moist and pinch together well. Press the graham cracker mixture firmly against the bottom of a 13x9 pan.Bake for 8-10 minutes. Cool completely. Using mixer, whip the heavy cream, sugar and vanilla together until whipping cream has stiff peaks, set aside. In another bowl, mix or whisk the instant pudding and milk until well combined. Set aside. Using mixer, beat the cream cheese until fluffy. Add the sweetened condensed milk and pudding. into the cream cheese. 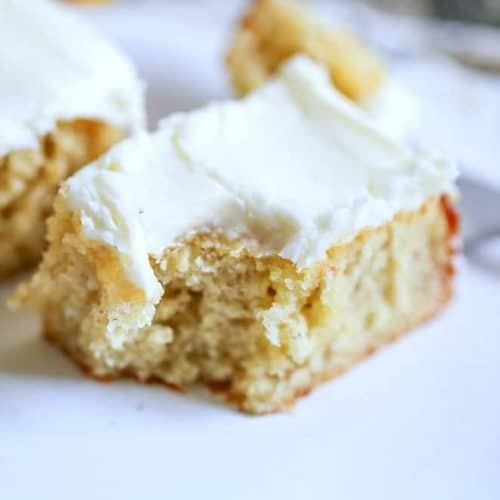 Fold in half the whipped cream with a spatula. 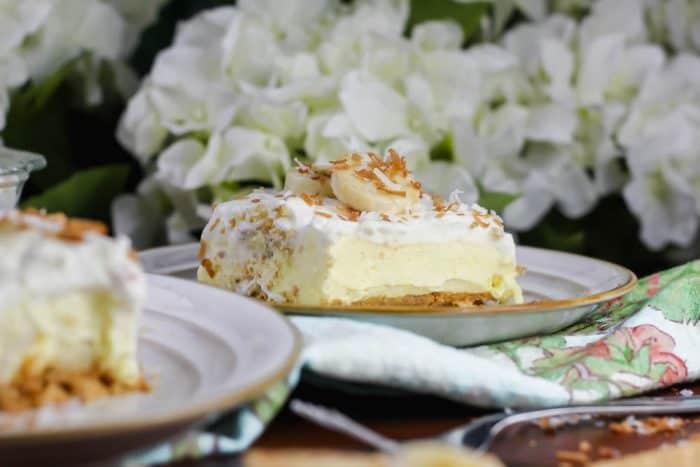 Slice bananas and press the to the bottom of the graham cracker crust. Add the cream cheese pudding filling to the top of the crust. 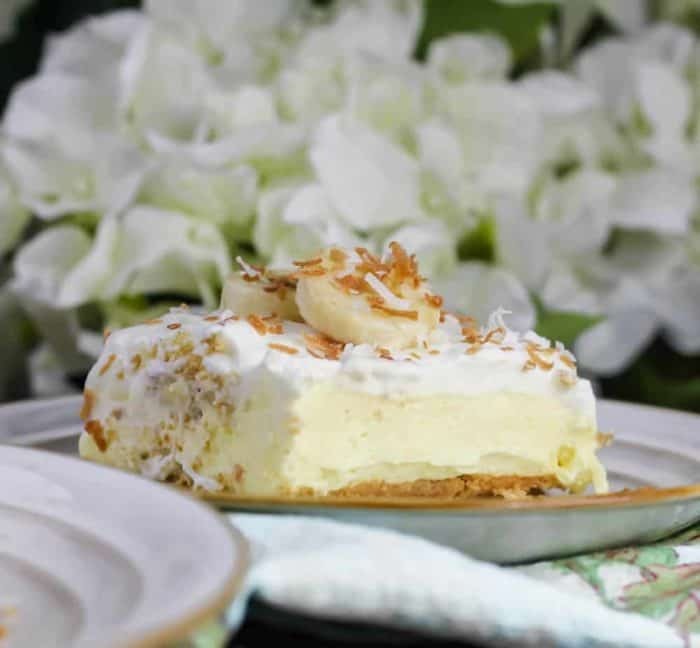 Smooth out the filling, then top with the remaining whipped cream, cover gently with plastic wrap, and chill for at least one hour. 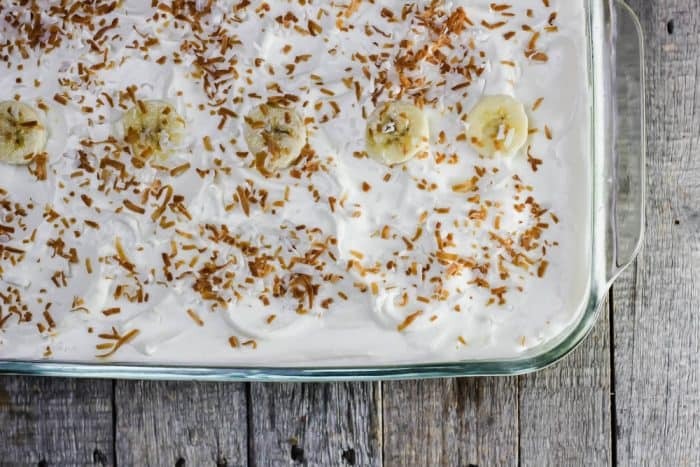 When you are ready to serve the pie you can add some sliced bananas on top with some toasted coconut. 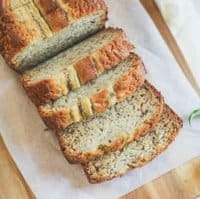 Toast coconut for 5-10 minutes at 325 degrees on baking sheet lined with parchment paper. Toss coconut every couple of minutes or so, so it doesn't burn, keep an eye on it. More Banana ideas? You got it!! 🙂 Life is full of banana skins. You slip, you carry on. Thank you so much Kelly! It was so exciting to be asked!! That is SO exciting that you were asked to compete!! Too bad the timing didn’t work out – I hope you get another shot. You’d rock it!! Also – TCM makes me think of staying overnight at my Grandma’s house. I loved it!! 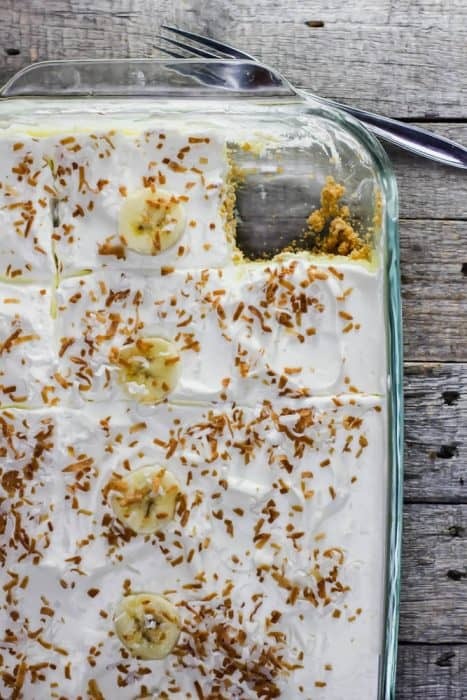 Banana cream pie in a pan???? Yes, please! I’d love it and the hubby would be over the moon. Wow, I hope you get invited again soon—I’d be rooting for you! !